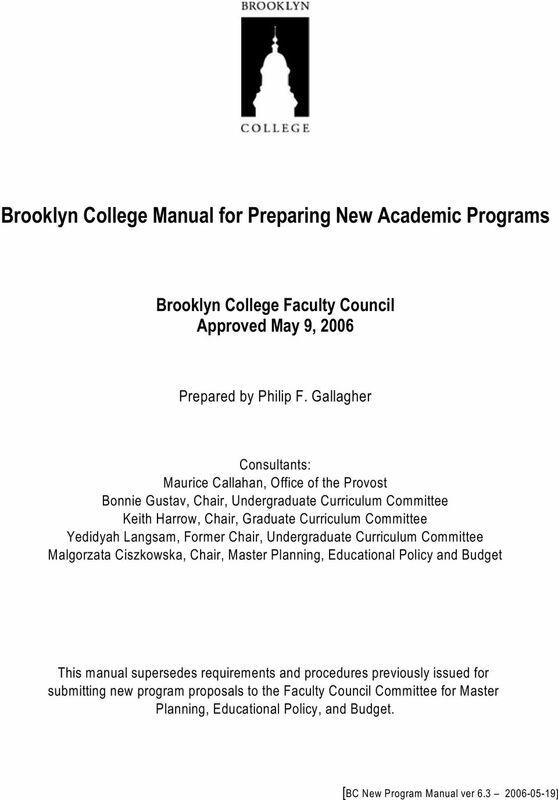 Download "Brooklyn College Manual for Preparing New Academic Programs"
2 Brooklyn College Manual for Preparing New Academic Programs In 2001 the City University of New York s Office of Academic Affairs (OAA) issued a Revised Faculty Handbook for the Preparation of New Academic Programs. 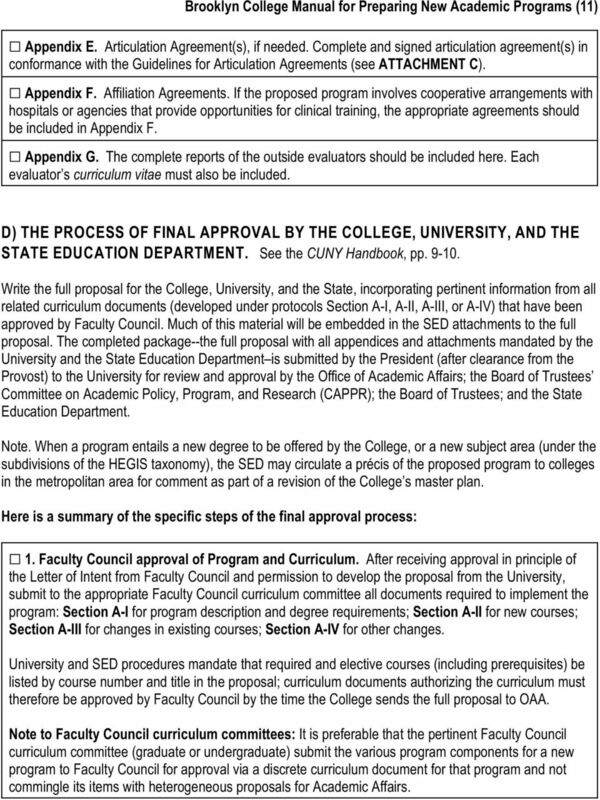 In order to receive approval from the Board of Trustees and, ultimately, the New York State Education Department (SED), every proposal for a new degree or certificate program must adhere to the procedures and format described in the Handbook and meet the criteria for approval enunciated therein. 1 The process for preparing new academic programs has two components: a Brooklyn College Faculty Council-centered curriculum approval process and a University-SED approval process. The two operate concurrently and interactively. The process is thorough and complex. With regard to those parts of the process that pertain to the University and the State, the Handbook is clear; the Brooklyn College steps in the process are not covered by the Handbook except to say that new programs must have College governance approval. This manual describes the Brooklyn College portion of the process. It also aims to present in a schematic manner the entire new program development and approval process, and to ensure 2 that Brooklyn College practices are in harmony with University procedures. This manual covers the planning, development, and approval process of all new programs, graduate and undergraduate (including 3 what are termed majors). If you wish assistance with this process, contact the Provost s Office. INTRODUCTION Every new program must undergo qualitative reviews and meet with the approval of appropriate governing bodies at three levels: Brooklyn College, the CUNY Board of Trustees, and the New York State Education Department. CRITERIA FOR EVALUATION: Proposals for new programs are evaluated according to the following standards. Justification for a new program proposal should emphasize the criteria listed below, as applicable. 1 There is one exception: see Guidelines for a Streamlined Approval Process for the Certificate Program that Is a Subset of a Registered Program. 2 Much of what appears below in the boxed lists has been borrowed from the CUNY Handbook, sometimes in paraphrase, often word for word. 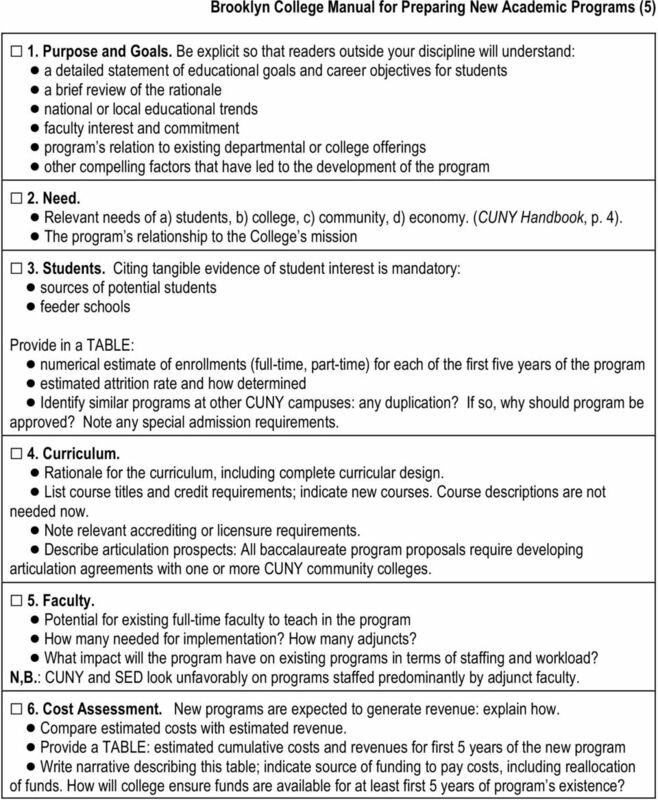 Consult the CUNY Handbook for a full description of University-mandated procedures. 3 Minor programs ( minors ) are not subject to new program procedures but follow instructions provided in Brooklyn College s Manual for Preparing Undergraduate Curriculum Proposals for Submission to the Faculty Council Committee on Curriculum and Degree Requirements (Undergraduate). The protocols for instituting new programs presented there (as well as in the Manual for Preparing Graduate Curriculum Proposals...) are superseded by the procedures described in this manual. 3 Brooklyn College Manual for Preparing New Academic Programs (3) 1. Academic Quality 2. Justification of Need 3. Regional, state and national societal needs 4. Career Opportunities for graduates 5. Student Interest 6. Relationship to other programs at CUNY (e.g., possible duplication) 7. Centrality to other campus programs and to the College and University missions 8. Resources available to implement the program 9. Conformity with the standards of accrediting agencies for the professions 10. Conformity with the regulations of the State Education Department SNAPSHOT OF THE APPROVAL PROCESS: there are four main steps, each of which has sub-sections: A) The Letter of Intent (below, pp. 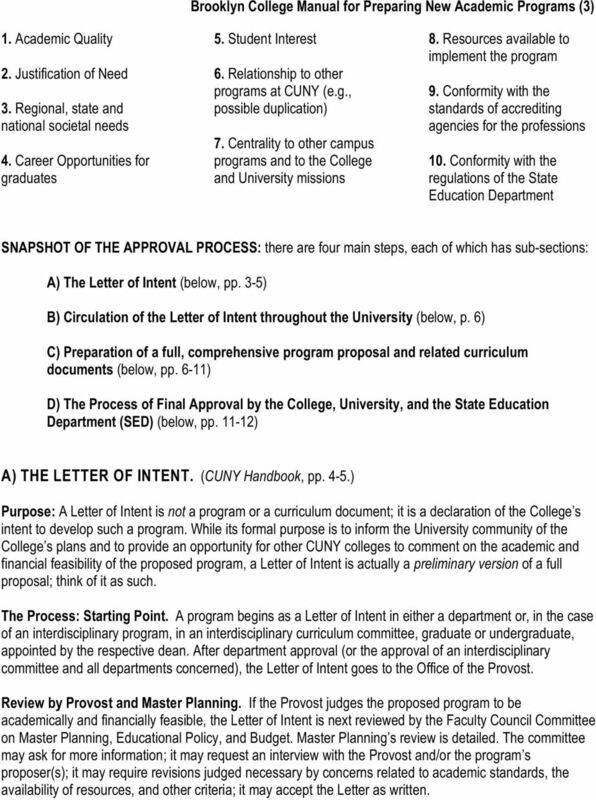 3-5) B) Circulation of the Letter of Intent throughout the University (below, p. 6) C) Preparation of a full, comprehensive program proposal and related curriculum documents (below, pp. 6-11) D) The Process of Final Approval by the College, University, and the State Education Department (SED) (below, pp ) A) THE LETTER OF INTENT. (CUNY Handbook, pp. 4-5.) Purpose: A Letter of Intent is not a program or a curriculum document; it is a declaration of the College s intent to develop such a program. 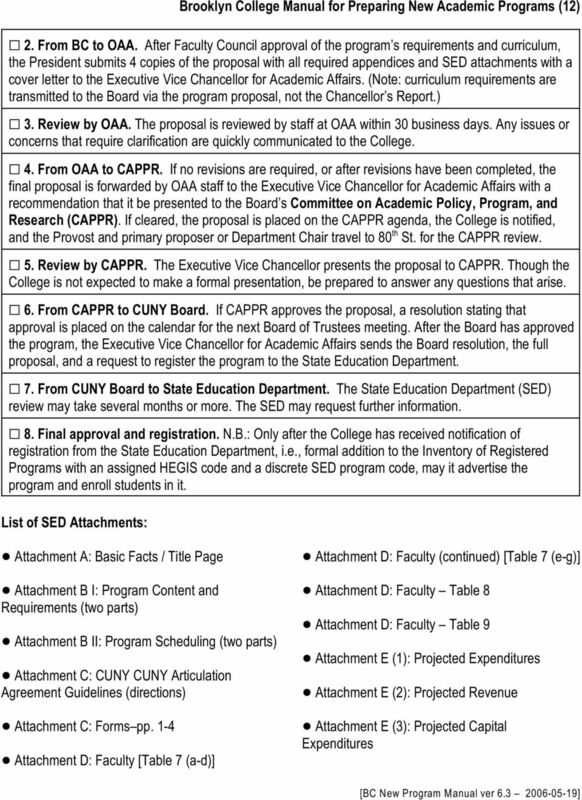 While its formal purpose is to inform the University community of the College s plans and to provide an opportunity for other CUNY colleges to comment on the academic and financial feasibility of the proposed program, a Letter of Intent is actually a preliminary version of a full proposal; think of it as such. The Process: Starting Point. A program begins as a Letter of Intent in either a department or, in the case of an interdisciplinary program, in an interdisciplinary curriculum committee, graduate or undergraduate, appointed by the respective dean. After department approval (or the approval of an interdisciplinary committee and all departments concerned), the Letter of Intent goes to the Office of the Provost. Review by Provost and Master Planning. If the Provost judges the proposed program to be academically and financially feasible, the Letter of Intent is next reviewed by the Faculty Council Committee on Master Planning, Educational Policy, and Budget. Master Planning s review is detailed. The committee may ask for more information; it may request an interview with the Provost and/or the program s proposer(s); it may require revisions judged necessary by concerns related to academic standards, the availability of resources, and other criteria; it may accept the Letter as written. 5 Brooklyn College Manual for Preparing New Academic Programs (5) G 1. Purpose and Goals. Be explicit so that readers outside your discipline will understand:! a detailed statement of educational goals and career objectives for students! a brief review of the rationale! national or local educational trends! faculty interest and commitment! program s relation to existing departmental or college offerings! other compelling factors that have led to the development of the program G 2. Need.! Relevant needs of a) students, b) college, c) community, d) economy. (CUNY Handbook, p. 4).! The program s relationship to the College s mission G 3. Students. Citing tangible evidence of student interest is mandatory:! sources of potential students! feeder schools Provide in a TABLE:! numerical estimate of enrollments (full-time, part-time) for each of the first five years of the program! estimated attrition rate and how determined! Identify similar programs at other CUNY campuses: any duplication? If so, why should program be approved? Note any special admission requirements. G 4. Curriculum.! Rationale for the curriculum, including complete curricular design.! List course titles and credit requirements; indicate new courses. Course descriptions are not needed now.! Note relevant accrediting or licensure requirements.! Describe articulation prospects: All baccalaureate program proposals require developing articulation agreements with one or more CUNY community colleges. G 5. Faculty.! Potential for existing full-time faculty to teach in the program! How many needed for implementation? How many adjuncts?! What impact will the program have on existing programs in terms of staffing and workload? N,B. : CUNY and SED look unfavorably on programs staffed predominantly by adjunct faculty. G 6. Cost Assessment. New programs are expected to generate revenue: explain how.! Compare estimated costs with estimated revenue.! Provide a TABLE: estimated cumulative costs and revenues for first 5 years of the new program! Write narrative describing this table; indicate source of funding to pay costs, including reallocation of funds. How will college ensure funds are available for at least first 5 years of program s existence? 6 Brooklyn College Manual for Preparing New Academic Programs (6) B) CIRCULATION OF THE LETTER OF INTENT THROUGHOUT THE UNIVERSITY. (CUNY Handbook, pp. 5-6: procedure ) University Review of the Letter of Intent. Once the Letter of Intent has been endorsed in principle by Master Planning, it proceeds concurrently to Faculty Council and, via the College President, to the University s Executive Vice Chancellor for Academic Affairs. The Letter of Intent is reviewed in that office and then circulated throughout the University for comment over a 30-day period. 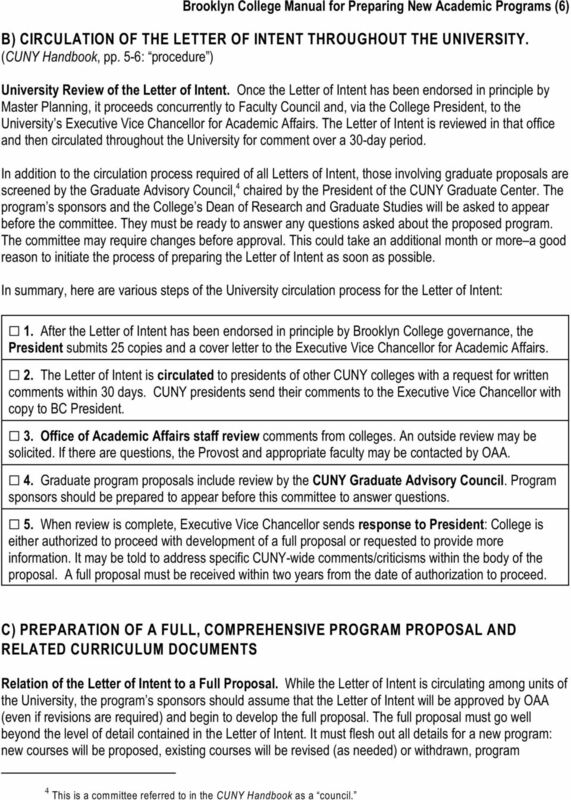 In addition to the circulation process required of all Letters of Intent, those involving graduate proposals are 4 screened by the Graduate Advisory Council, chaired by the President of the CUNY Graduate Center. The program s sponsors and the College s Dean of Research and Graduate Studies will be asked to appear before the committee. They must be ready to answer any questions asked about the proposed program. The committee may require changes before approval. This could take an additional month or more a good reason to initiate the process of preparing the Letter of Intent as soon as possible. In summary, here are various steps of the University circulation process for the Letter of Intent: G 1. After the Letter of Intent has been endorsed in principle by Brooklyn College governance, the President submits 25 copies and a cover letter to the Executive Vice Chancellor for Academic Affairs. G 2. The Letter of Intent is circulated to presidents of other CUNY colleges with a request for written comments within 30 days. CUNY presidents send their comments to the Executive Vice Chancellor with copy to BC President. G 3. Office of Academic Affairs staff review comments from colleges. An outside review may be solicited. If there are questions, the Provost and appropriate faculty may be contacted by OAA. G 4. Graduate program proposals include review by the CUNY Graduate Advisory Council. Program sponsors should be prepared to appear before this committee to answer questions. G 5. When review is complete, Executive Vice Chancellor sends response to President: College is either authorized to proceed with development of a full proposal or requested to provide more information. It may be told to address specific CUNY-wide comments/criticisms within the body of the proposal. A full proposal must be received within two years from the date of authorization to proceed. C) PREPARATION OF A FULL, COMPREHENSIVE PROGRAM PROPOSAL AND RELATED CURRICULUM DOCUMENTS Relation of the Letter of Intent to a Full Proposal. While the Letter of Intent is circulating among units of the University, the program s sponsors should assume that the Letter of Intent will be approved by OAA (even if revisions are required) and begin to develop the full proposal. The full proposal must go well beyond the level of detail contained in the Letter of Intent. 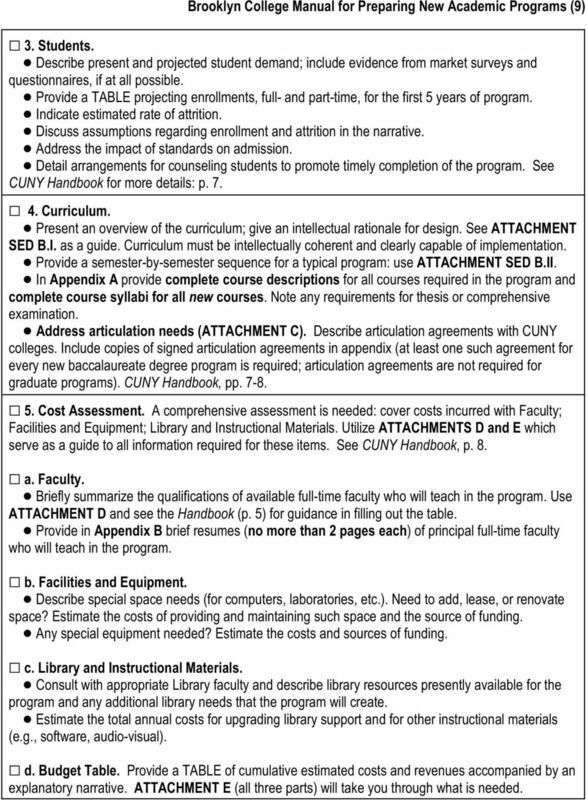 It must flesh out all details for a new program: new courses will be proposed, existing courses will be revised (as needed) or withdrawn, program 4 This is a committee referred to in the CUNY Handbook as a council. 7 Brooklyn College Manual for Preparing New Academic Programs (7) requirements will be put into appropriate legislative language, and so forth. The full proposal (excluding appendices and SED attachments) should not, however, exceed 25 pages. Faculty Council Curriculum Committee review and Faculty Council approval. The actual content of every degree or certificate/advanced certificate program must be drafted as curricular legislation, reviewed by the appropriate Faculty Council curriculum committee (graduate or undergraduate), and then submitted to Faculty Council for approval. Every proposal for a program must be approved by the University, but it is the approval of curriculum documents by the College (and ultimately by the Trustees and the State, via the program proposal) that brings institutional reality to a new program. Curriculum documents are generated by the program s sponsor(s) and approved by the pertinent department(s). They are then submitted to either the Undergraduate Committee on Curriculum and Degree Requirements or the Committee on Graduate Curriculum and Degree Requirements. Curriculum protocols. Submission of curriculum documents must follow Faculty Council protocols (outlined in the respective curriculum manuals referred to above): Sections A-I, A-II, A-III, A-IV. By the time the University has authorized the College to proceed with a full proposal, Faculty Council will have endorsed in principle the intent to develop the program; after this endorsement, Faculty Council curriculum committees will accept new program curriculum documents for review. Departments may create new courses (Section A-II) or revise old courses (Section A-III) at any time, but new or revised courses that will be part of the proposed program should be identified as such and ideally submitted to the appropriate curriculum committee when degree requirements (Section A-I) for the new program are submitted. Certain other matters (e.g., reactivation or withdrawal of courses) fall under Section A-IV: Other Changes. All of the above will eventually appear in a discrete document submitted to Faculty Council by the appropriate Faculty 5 Council curriculum committee. Advice about timing when to start working on the full proposal:! Do not wait for University approval of the Letter of Intent to begin work on the full proposal: delays in the review process are common. Write the proposal as soon as possible; revise later, if necessary.! Begin formal preparation of the necessary curriculum documents noted above (A-I, A-II, A-III, A- IV) as soon as Faculty Council has endorsed in principle Master Planning s resolution on the Letter of Intent. (To be sure this has happened, check with your department chairperson or with the Office of Faculty Council 1415 Boylan). At the same time, flesh out the full program proposal. 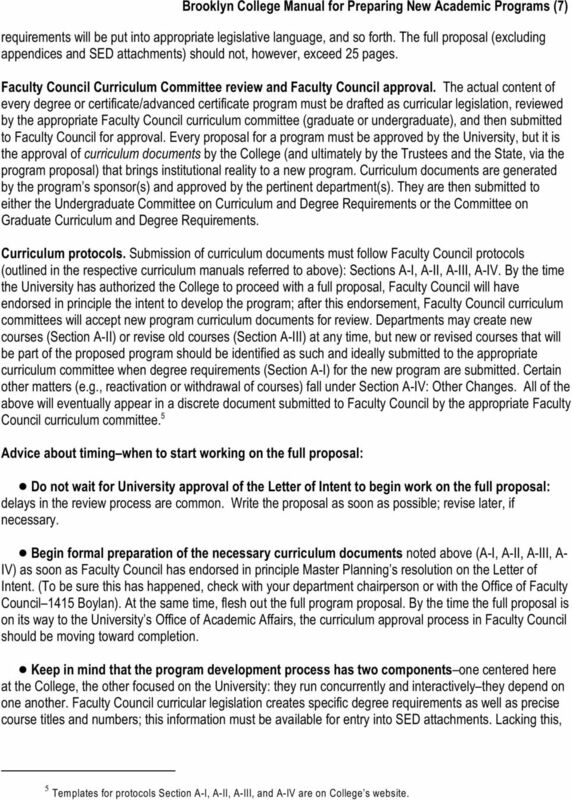 By the time the full proposal is on its way to the University s Office of Academic Affairs, the curriculum approval process in Faculty Council should be moving toward completion.! Keep in mind that the program development process has two components one centered here at the College, the other focused on the University: they run concurrently and interactively they depend on one another. Faculty Council curricular legislation creates specific degree requirements as well as precise course titles and numbers; this information must be available for entry into SED attachments. Lacking this, 5 Templates for protocols Section A-I, A-II, A-III, and A-IV are on College s website. 8 Brooklyn College Manual for Preparing New Academic Programs (8) the University s Office of Academic Affairs cannot advance the proposal to the Board Committee on Academic Policy, Program, and Research (CAPPR) or the Board of Trustees. Length: the full proposal (excluding appendices and SED attachments) should not exceed 25 pages. Audience: the chief academic officers and staff at the College, the CUNY Office of Academic Affairs, and the Board CAPPR, as well as, ultimately, the staff of the New York State Education Department. Advice on preparing the content of the full proposal: The details of a full proposal are similar to those of the Letter of Intent. If the latter has been carefully prepared, the full proposal should not be too much extra work, although preparation of the University- and SED-required forms is time-consuming and must be executed meticulously. Between the Letter of Intent and the University s go-ahead on a full proposal, gather the additional information required. Create new courses, revise existing ones, and structure degree requirements and have them approved by the department(s). 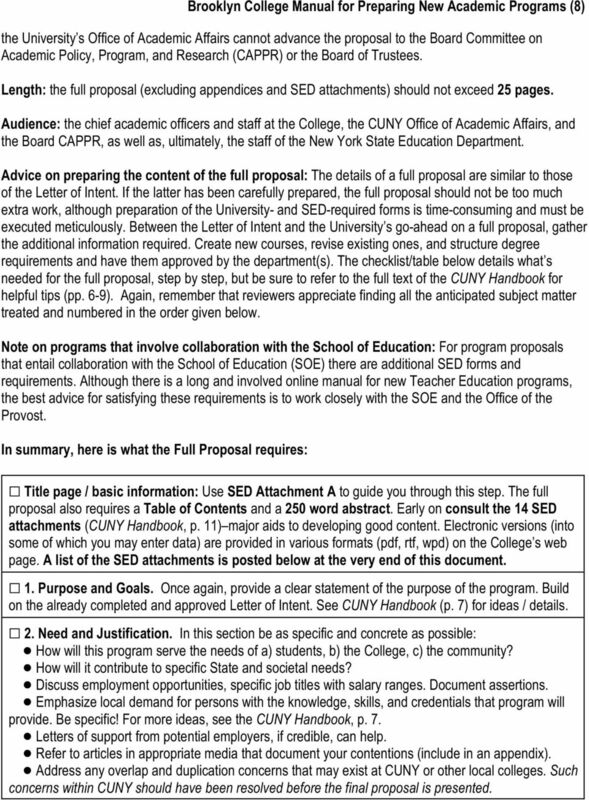 The checklist/table below details what s needed for the full proposal, step by step, but be sure to refer to the full text of the CUNY Handbook for helpful tips (pp. 6-9). Again, remember that reviewers appreciate finding all the anticipated subject matter treated and numbered in the order given below. Note on programs that involve collaboration with the School of Education: For program proposals that entail collaboration with the School of Education (SOE) there are additional SED forms and requirements. Although there is a long and involved online manual for new Teacher Education programs, the best advice for satisfying these requirements is to work closely with the SOE and the Office of the Provost. In summary, here is what the Full Proposal requires: G Title page / basic information: Use SED Attachment A to guide you through this step. The full proposal also requires a Table of Contents and a 250 word abstract. Early on consult the 14 SED attachments (CUNY Handbook, p. 11) major aids to developing good content. Electronic versions (into some of which you may enter data) are provided in various formats (pdf, rtf, wpd) on the College s web page. A list of the SED attachments is posted below at the very end of this document. G 1. Purpose and Goals. Once again, provide a clear statement of the purpose of the program. Build on the already completed and approved Letter of Intent. See CUNY Handbook (p. 7) for ideas / details. G 2. Need and Justification. In this section be as specific and concrete as possible:! How will this program serve the needs of a) students, b) the College, c) the community?! How will it contribute to specific State and societal needs?! Discuss employment opportunities, specific job titles with salary ranges. Document assertions.! Emphasize local demand for persons with the knowledge, skills, and credentials that program will provide. Be specific! For more ideas, see the CUNY Handbook, p. 7.! Letters of support from potential employers, if credible, can help.! Refer to articles in appropriate media that document your contentions (include in an appendix).! Address any overlap and duplication concerns that may exist at CUNY or other local colleges. Such concerns within CUNY should have been resolved before the final proposal is presented. 9 Brooklyn College Manual for Preparing New Academic Programs (9) G 3. Students.! Describe present and projected student demand; include evidence from market surveys and questionnaires, if at all possible.! Provide a TABLE projecting enrollments, full- and part-time, for the first 5 years of program.! Indicate estimated rate of attrition.! Discuss assumptions regarding enrollment and attrition in the narrative.! Address the impact of standards on admission.! Detail arrangements for counseling students to promote timely completion of the program. See CUNY Handbook for more details: p. 7. G 4. Curriculum.! Present an overview of the curriculum; give an intellectual rationale for design. See ATTACHMENT SED B.I. as a guide. Curriculum must be intellectually coherent and clearly capable of implementation.! Provide a semester-by-semester sequence for a typical program: use ATTACHMENT SED B.II.! In Appendix A provide complete course descriptions for all courses required in the program and complete course syllabi for all new courses. Note any requirements for thesis or comprehensive examination.! Address articulation needs (ATTACHMENT C). Describe articulation agreements with CUNY colleges. Include copies of signed articulation agreements in appendix (at least one such agreement for every new baccalaureate degree program is required; articulation agreements are not required for graduate programs). CUNY Handbook, pp G 5. Cost Assessment. A comprehensive assessment is needed: cover costs incurred with Faculty; Facilities and Equipment; Library and Instructional Materials. Utilize ATTACHMENTS D and E which serve as a guide to all information required for these items. See CUNY Handbook, p. 8. G a. Faculty.! Briefly summarize the qualifications of available full-time faculty who will teach in the program. Use ATTACHMENT D and see the Handbook (p. 5) for guidance in filling out the table.! Provide in Appendix B brief resumes (no more than 2 pages each) of principal full-time faculty who will teach in the program. G b. Facilities and Equipment.! Describe special space needs (for computers, laboratories, etc.). Need to add, lease, or renovate space? Estimate the costs of providing and maintaining such space and the source of funding.! Any special equipment needed? Estimate the costs and sources of funding. G c. Library and Instructional Materials.! Consult with appropriate Library faculty and describe library resources presently available for the program and any additional library needs that the program will create.! Estimate the total annual costs for upgrading library support and for other instructional materials (e.g., software, audio-visual). G d. Budget Table. Provide a TABLE of cumulative estimated costs and revenues accompanied by an explanatory narrative. ATTACHMENT E (all three parts) will take you through what is needed. 10 Brooklyn College Manual for Preparing New Academic Programs (10) G 6. Evaluation. In this section you must describe the internal and external evaluation. G a. Internal Evaluation and Outcomes Assessment.! How will program quality be monitored in the first 5 years? Include a discussion of desired outcomes for students and program.! Indicate measures that will be used in assessment, including any prospective departmental (collegiate) external evaluation.! State the criteria to be examined. See CUNY Handbook, p. 9, for more details. G b. External Evaluation. This section is required of all graduate programs and is distinct from periodic departmental external evaluations noted above.! The SED mandates that all new Master s programs be evaluated by one expert in the subject area who is from a college or university outside the New York metropolitan area. (See CUNY Handbook, p. 9, for prospective doctoral programs.) OAA, however, requires two outside evaluations for both new master s and new doctoral programs.! Evaluators names, positions, and affiliations should be identified in this section. Put the full reports of evaluators along with the curriculum vitae of each evaluator in an appendix. N.B. The requirement for External Evaluation of new Master s programs means that the completed full proposal must be sent to outside evaluators before the full proposal with these evaluations can be sent to the University s OAA. Be sure to plan at least two-three weeks for this evaluation into your schedule. APPENDICES. Following your narrative add any required appendices. Requirements will vary depending on the nature of your proposal. Appendices A and B are necessary for all proposals. Label the appendices consecutively; there should be no gaps in labeling. For example, if there are no survey instruments (as in Appendix C below), the next appendix, whatever its title, should be labeled Appendix C. For more information on appendices, see the CUNY Handbook, pp G Appendix A. Course descriptions and syllabi. The Brooklyn College Bulletin descriptions of all courses required in the program must be appended here. In addition, complete course syllabi must be included for all new courses. G Appendix B. A curriculum vitae (brief resume no more than 2 pages preferred) should be included for each principal full-time faculty member who will teach courses required in the program. Appendices C, D, E, F, and G are applicable only to some programs. Include if needed. G Appendix C. Survey instruments and results. If the college conducted a survey to determine the need for the program, the actual survey form should be appended here, as well as a summary of the findings. G Appendix D. Letters of external support. The letters must be current and the signatories should not be directly connected to the College. 11 Brooklyn College Manual for Preparing New Academic Programs (11) G Appendix E. Articulation Agreement(s), if needed. Complete and signed articulation agreement(s) in conformance with the Guidelines for Articulation Agreements (see ATTACHMENT C). G Appendix F. Affiliation Agreements. If the proposed program involves cooperative arrangements with hospitals or agencies that provide opportunities for clinical training, the appropriate agreements should be included in Appendix F. G Appendix G. The complete reports of the outside evaluators should be included here. Each evaluator s curriculum vitae must also be included. D) THE PROCESS OF FINAL APPROVAL BY THE COLLEGE, UNIVERSITY, AND THE STATE EDUCATION DEPARTMENT. See the CUNY Handbook, pp Write the full proposal for the College, University, and the State, incorporating pertinent information from all related curriculum documents (developed under protocols Section A-I, A-II, A-III, or A-IV) that have been approved by Faculty Council. Much of this material will be embedded in the SED attachments to the full proposal. The completed package--the full proposal with all appendices and attachments mandated by the University and the State Education Department is submitted by the President (after clearance from the Provost) to the University for review and approval by the Office of Academic Affairs; the Board of Trustees Committee on Academic Policy, Program, and Research (CAPPR); the Board of Trustees; and the State Education Department. Note. When a program entails a new degree to be offered by the College, or a new subject area (under the subdivisions of the HEGIS taxonomy), the SED may circulate a précis of the proposed program to colleges in the metropolitan area for comment as part of a revision of the College s master plan. Here is a summary of the specific steps of the final approval process: G 1. Faculty Council approval of Program and Curriculum. 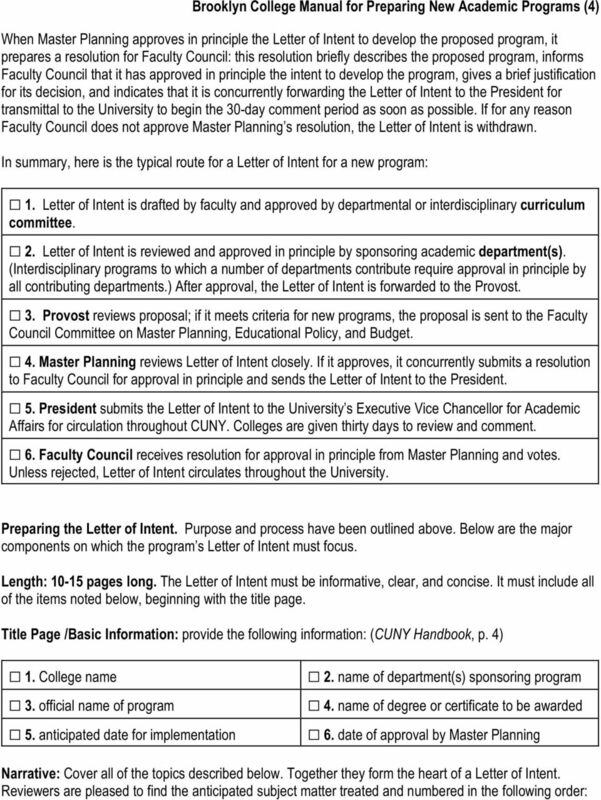 After receiving approval in principle of the Letter of Intent from Faculty Council and permission to develop the proposal from the University, submit to the appropriate Faculty Council curriculum committee all documents required to implement the program: Section A-I for program description and degree requirements; Section A-II for new courses; Section A-III for changes in existing courses; Section A-IV for other changes. 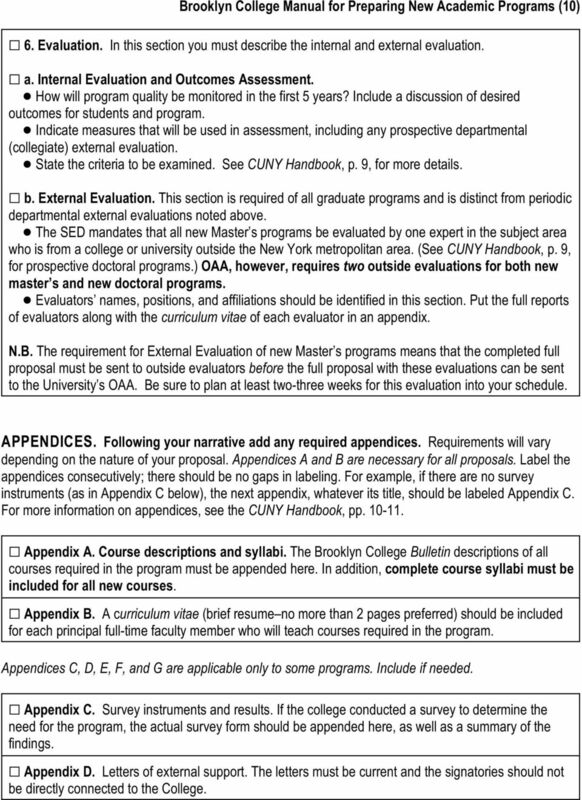 University and SED procedures mandate that required and elective courses (including prerequisites) be listed by course number and title in the proposal; curriculum documents authorizing the curriculum must therefore be approved by Faculty Council by the time the College sends the full proposal to OAA. Note to Faculty Council curriculum committees: It is preferable that the pertinent Faculty Council curriculum committee (graduate or undergraduate) submit the various program components for a new program to Faculty Council for approval via a discrete curriculum document for that program and not commingle its items with heterogeneous proposals for Academic Affairs.